Front Porch Realty - FVHS Students move onto National Level! FVHS Students move onto National Level! What an honor it has been to be able to work with the awesome young adults of Fuquay Varina High School’s Future Business Leaders of America group. After competing at the regional level, thirteen of these bright students have just moved on to state level at the NC State FBLA conference in Greensboro. A record nine of these students have placed in their competitive events and qualified for the national competition in Chicago June 29-July 2, 2015. Please join FRONT PORCH REALTY in helping to fund their trip to Chicago. Contact Mr. Bob Lee, M.Ed., Special Populations Coordinator, FBLA Advisor, FVHS, 919-557-2561, rlee@wcpss.net for details on how you can contribute. The success of these bright students says so much for their leadership advisor, Mr. Bob Lee. Mr. Lee has continually increased the FBLA membership at the high school along with going above and beyond to help his students compete at that high level. How fortunate are both these hard working kids and FV High School, to have Mr. Lee’s dedication! 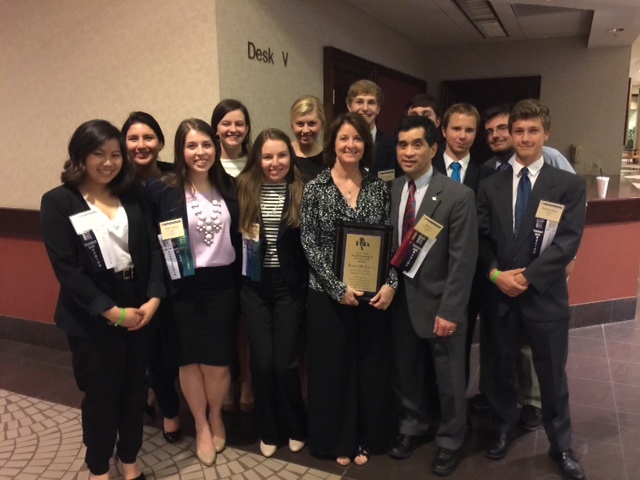 Laura McCorry with FVHS students at the FBLA’s State Competion.